Steeped in centuries of tradition, Catholic colleges and universities are a pillar of the American postsecondary system. These institutions combine secular and religious studies, offering students a premium education integrated with principles of the Jesuit faith. Catholic colleges and universities strive to educate the whole student through comprehensive curricula that challenge the mind, body and spirit. Guided by the philosophy that faith should not conflict with reason, Catholic institutions place great emphasis on scholarship, fellowship and community service. Jesuit schools offer top-tier degree and certificate programs in fields like business, education, STEM, healthcare and the liberal arts. Many of these institutions maintain a low student-to-faculty ratio and relatively small class sizes (i.e., 20 students or less) to ensure that each individual learner receives more personalized attention from his or her instructors. Many of today's Catholic colleges and universities also offer undergraduate, master's and doctorate programs that can be completed entirely online. These options follow the same curricula and degree timetable as brick-and-mortar options, leading to an equal number of job offers for successful graduates. Online programs are also ideal for students with busy schedules, thanks to a flexible format that allows them to study from home, and the tuition rates for distance learning programs are often lower than their campus-based counterparts. Below, we've ranked the country's top online Catholic colleges and universities. Our list was generated using a comprehensive grading system that takes several factors into account, including course offerings, student and graduate outcomes, tuition rates, financial aid opportunities and online learning experiences. 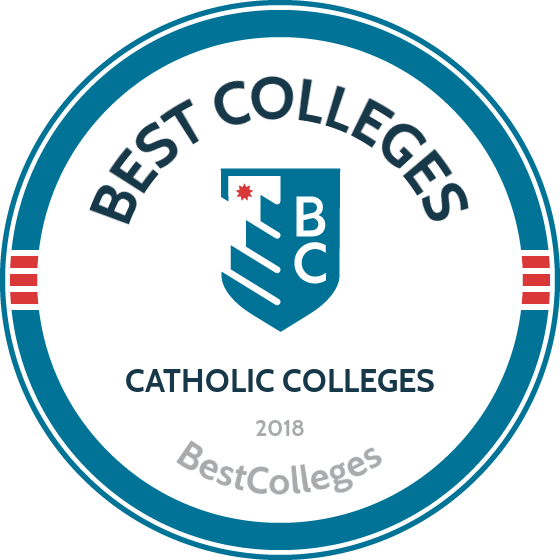 If you are considering a Catholic college education and are interested in the online format, then our ranking should provide a good starting point in your search for the best online Catholic college. Villanova, located in a suburb northwest of Philadelphia, has deep roots in the Augustinian Roman Catholic community. With values on critical thinking, acting compassionately, and serving others, Villanova is one of the top-tier catholic online colleges. Villanova partners with Bisk — a leading facilitator of e-learning programs — to deliver a variety of fully online programs. Online students can work towards undergraduate degrees, graduate degrees, or professional certifications within the College of Liberal Arts & Sciences, the School of Law, and the College of Professional Studies. Villanova offers a BA in Leadership Studies, BIS General Studies, and a BA in Public Service and Administration. The College of Engineering offers several online master’s degrees, including Biochemical Engineering, Computer Engineering, and others. Their School of Business offers an online MBA. Through Blackboard, online students access streaming videos and MP3s or MP4s of class lectures. Villanova’s online programs are not available in every state. Georgetown, the oldest Catholic and Jesuit university in the United States, offers several online master’s degrees within their School of Continuing Studies. Online students can choose between multiple Master of Professional Studies Degrees or a Bachelor of Arts in Liberal Studies. Popular programs within the professional studies program include Emergency & Disaster Management, Integrated Marketing Communications, Public Relations & Corporate Communications, Real Estate, Sports Industry Management, and Technology Management. Students at this online catholic college can enroll part-time or full-time. Online classes are delivered through Blackboard and Canvas. Students have access to Zoom, a tool that allows them to conduct online audio and video meetings and group chats. Distance learners who are visiting the downtown D.C. area are welcome to enjoy camps activities for networking and professional development workshops. Many programs require capstone and internship requirements. Students fulfill the theology requirement as part of the school’s core requirements. Saint Scholastica, one of the best online catholic colleges and universities in the United States, is a Catholic Benedictine university located in Duluth, Minnesota. Dedicated to their values — community, hospitality, respect, stewardship and love of learning — the College of Saint Scholastica offers several fully online programs. This includes undergraduate and graduate degrees, graduate certificates and licensures, and a doctorate degree in Transitional Doctor of Physical Therapy. One of the popular online bachelor’s degrees is in Computer Information Systems and Organizational Behavior. Students who are interested in healthcare can pursue an RN to BS degree. Several master's degrees are available, including an MBA in Rural Healthcare, MS in Project Management, and Master of Education. Online coursework is delivered through Blackboard and students have access to VoiceThread, which allows instructors to communicate with students through text, audio, and video. The faculty at The College of St. Scholastica is dedicated to critical thinking and problem solving. Duquesne, located in Pittsburgh, PA, has been around for over 135 years. It’s a Catholic university founded by the Spiritans — members of the Congregation of the Holy Spirit. Online students at this Catholic online college can choose between fully online programs or blended online/on-campus degree programs. Online undergraduate programs include BSN-RN, BS in Behavioral Science, and BS in Organizational Leadership. Fully online master’s programs include MS in Nursing, MS in Instructional Technology, MS of Management, MS of Sports Business, and MA in Communications. Duquesne offers online doctorate programs, such as the Doctoral Program in Instructional Technology and Leadership and PhD in Nursing. Online coursework is delivered through Blackboard and students are encouraged to actively participate in both synchronous and asynchronous discussions. Online students receive advising and support services, technical help, academic resources, a student support success network, and a network of more than 90,000 alumni. Duquesne’s faculty are committed a teacher-scholar model for all online programs. Founded in 1878, Creighton University is located in Omaha, Nebraska, one of the cities ranked best for overall quality of life by Money Magazine. It provides a Jesuit education by promoting principles of service, social justice, and self-reflection; the school is not partial to any specific faith or tradition. Creighton is an online Catholic college that offers over twenty online degree programs, including certificates, master's, and doctorate degree programs. Traditional degrees available include an online MBA, MS in Educational Leadership, and MS in Nursing. The school offers some unique degree options, such as MS in Health and Wellness Coaching and MA in Medical Anthropology. Online students are assigned a student services coordinator and have access to financial aid advisors, the career services department, and a technical help desk that’s available 24/7. Classes are delivered asynchronously through online discussion boards, videos, and e-portfolios. Students work on group projects and have opportunities for on-campus residencies. Gonzaga University is a private Catholic college located in Spokane, Washington. Gonzaga has an entire office dedicated to online instruction called the Virtual Campus Instruction Design & Delivery (iDD) which strives to meet the unique needs of online learners. Online coursework is delivered asynchronously through multiple formats, including video- and audio-enhanced discussion boards, content webinars, podcasts, interactive quizzes, real-time sessions, and office hours with faculty. Gonzaga offers a number of robust learning tools to keep students collaborating, such as GoToMeeting, Google Docs, SharePoint, and Back Channel Discussions. The school has a variety of graduate programs, including MA in Communication & Leadership, Organizational Leadership, Theology and Leadership, and Transmission and Distribution Engineering. Doctor of Nursing Practice degrees are available online. Encouraging cross-cultural experiences, Gonzaga offers several study abroad and domestic immersion programs. Immersions are designed to enhance student’s education and personal development by providing a connection to their faculty, fellow students, and the campus. Saint Mary-of-the-Woods online college is designed specifically for adult learners. It offers flexible, accredited, and affordable bachelor's and associate’s degree programs. This Catholic online college offers a student-centered approach with 40 years of experience in distance learning formats and more than 25 majors, including marketing, history, paralegal studies, and professional writing. The school offers specialty programs, such as certificates in music therapy and transition to teaching. Online students are expected to work on written reports, projects, assignments, and online quizzes. Courses are offered in 8-week terms and usually take individuals an average of four weeks to complete (a degree can be earned in four-years). Online students have access to many campus resources, such as faculty advisors, online tutoring, mentors, and a student network. Saint Mary-of-the-Woods is a military friendly college and offers unique benefits to those who qualify. Saint Mary has many online scholarships available. Esse non videri — “To be, not to seem” — Saint Joseph's motto, represents their dedication to integrity, intellectual and spiritual values, social responsibility, and service. Boasting a generous transfer credit systems, students can transfer up to 90 transfer credits. Transfer courses must have been completed with a grade of “C” or higher; a “D” will be accepted by students who already hold an associate degree. Distance learners at all different levels, from high school graduates to adult learners, can find their place at this online Catholic college. The school offers flexible online undergraduate, graduate, and certificate programs that are designed to allow online students to complete their online college courses at their own pace. Students choose between 16 programs across 8 fields: business, criminal justice, health administration, human resources, human services, psychology, religious studies, or general studies. Online students have access to academic advisers, the school library, and technology support. Students usually spend around three-hours a week on a three-credit course at Saint Joseph’s (not including assignments and studying). Wheeling Jesuit is an online Catholic college located in Wheeling, West Virginia, with cutting-edge research opportunities and a commitment to creating outstanding online education opportunities. The university’s online programs are designed for individuals who work full-time and want to continue their education. Wheeling offers an online Accelerated Certification for Teaching, a Master’s in Education Leadership, a Multi-Categorical Special Education, Superintendent Licensure, Master’s of Science in Nursing, a MBA, and RN to BSN/MSN. Distance learners looking to apply for the school’s online MBA program must have a cumulative GPA of 2.8, credit for professional work experience, and three letters of recommendation. Online coursework is delivered through Blackboard and includes discussion boards and online chats. Assignments include papers, internet searches, case studies, and quizzes. Online students are required to attend an in-person orientation on campus during the first semester to meet with faculty and other students and gather important online student information. Founded in 1924 by the Religious Sisters of Mercy, Misericordia is a Roman Catholic college that specializes in adult learning and continuing education. The predominately female university, located in the suburb of Dallas, Pennsylvania, offers many online programs and courses. Most students at this online Catholic college are self-directed and have previously earned college credits or an associate's degree and are working towards a bachelor's degree. Undergraduate options include accounting, business administration, government, law and national security, healthcare management, and IT. Students can enroll in undergraduate certificate programs. Misericordia offers distance learners graduate coursework. Graduate options include an online MBA, Doctor of Occupational Therapy, and Doctor of Nursing Practice. Misericordia offers web-enhanced courses in 7- or 15-week formats, which consist of face-to-face and online courses allowing students to have a more centralized asynchronous virtual learning environment. Summer classes are offered to help students improve their GPA, replace a grade, and lighten their course load. At Canisius, students receive an education from a university dedicated to Jesuit values, real-world experiences, rigor, and quality. Canisius, located in Buffalo, NY, offers 12 unique degrees and 6 advanced certificates with fully online and hybrid classes. One of the best online Catholic colleges and universities, Canisius has multiple options for individuals who hold teacher certifications, including Educational Leadership, Physical Education, and Teaching English to Speakers of Other Languages. Master’s degrees in sports and health and arts and sciences are available. Online students have 24/7 accessibility to the virtual classroom and library and are assigned an advisor and an internship coordinator upon enrollment. Students have access to an online writing tutor program. Instructors individually design courses and online students can expect to complete a variety of requirements and assignments, including projects, standard testing, and hands-on tests. The student to faculty ratio is 12:1, allowing students to engage and collaborate closely with classmates and the teacher. Lewis, located in Romeoville, IL, is a regionally accredited, not-for-profit, Catholic university sponsored by the De La Salle Christian Brothers. The school offers a variety of customizable, fully online, master’s degree programs. Students can choose between master’s degrees in Aviation and Transportation, Organizational Leadership, Computer Science, Data Science, Criminal/Social Justice, Public Safety Administration, or Nursing. Graduate students can opt to work towards certificates as well. Lewis boasts small class sizes and individualized attention from expert faculty. By accessing the virtual classroom through an online learning system, students can expect to complete readings and assignments, write papers, complete projects, and participate in group discussions. Students at this Catholic online college are assigned a personal student services coordinator and have access to 24/7 technical support. Online courses are 100% online and are taught asynchronously. Financial aid is available to students who qualify. Saint Joseph’s, founded in 1851 by the Society of Jesus, is a Jesuit institution located in Philadelphia. The school offers a variety of online programs. Students can choose from many undergraduate and graduate degrees, including a MS in Business Intelligence and Analytics, MBA, MS in Criminal Justice, MS of Ed in Special Education, and a MS in Strategic Human Resource Management. Online graduate certificates available include K–12 English as a Second Language Endorsement, Instructional Technology Specialist, and Wilson’s Reading System. (the Wilson Reading System teaches struggling students how to read more fluently using a multi-sensory, structured language program.) Dedicated to helping adult students achieve their educational goals, Saint Joseph offers adult learner several options through their Professional and Liberal Studies program. These degrees are designed for adults looking to earn a bachelor's degree or complement their degree with a post-baccalaureate certificate. Adult learner classes can be taken part-time or full-time at this online Catholic college. A top-tier Catholic research university, The University of Dayton is made up of a diverse community devoted to the Marianist tradition of education for service, justice, and peace. This online Catholic college offers many online programs across the School of Education and Health Sciences, the School of Engineering, and the School of Business Administration, which offers an online MBA. Few students complete their master’s degree entirely online, but it is an option for select programs. (Blended online and traditional courses are more common.) University of Dayton's online course options are offered asynchronously and taught by qualified educators. Online students are expected to be part of class discussion. Classes are kept small to increase student engagement and allow for individual attention from the teachers. The University of Dayton boasts an Office of E-Learning that supports the teaching and learning initiatives for online programs and is dedicated to providing an equal level of quality for the online classroom. DeSales, located in Center Valley, Pennsylvania, is grounded in Roman Catholic principles. The school’s online program, ACCESS, offers many bachelor's degrees and certificates. Undergraduate programs include business administration, accounting, criminal justice, finance, marketing, nursing, psychology, and theology. In order to graduate, ACCESS programs require students to complete 40, three-credit courses. Certificate programs consists of six to twelve courses focuses on one key area, such as digital art, human resources management, or financial planning. DeSales will accept up to 75 previously earned credits from other accredited universities. Online students have maximum flexibility with full-time and part-time options, synchronous and asynchronous courses, blended formats, and eleven start dates every year. Coursework is delivered through Blackboard Learn. All online students at this Catholic online college are assigned an academic advisor who helps plan their degrees and support them for the duration of the program. Sacred Heart, one of the largest online Catholic colleges and universities in New England, is a contemporary liberal arts school. The school has a mission to prepare students to lead and serve in the world, and the faculty is committed to providing a rigorous interdisciplinary education for their students. The university offers multiple online undergraduate and graduate degree programs across many fields, including nursing, applied psychology, social work, and english as a second language. Students at Sacred Heart can expect to work both independently and in groups with online peers. Online coursework is delivered through Blackboard and is available to students 24/7. The school has an Office of Instructional Technology that supports online students with application of the educational tools. Online students are assigned a student services coordinator to support them throughout duration of program. The school is regionally accredited. Based in Chicago, DePaul University has a distinctive Catholic, Vincentian, and urban identity. DePaul offers several online programs with small class sizes and one-on-one attention from professors. Undergraduate options include communication and media, computer science, IT, and psychology. Multiple master of science degrees are available, including accounting, business information technology, game programming, and public service management. Online students can choose from MA, MPA, and MEd options. Classes are delivered through the Desire2Learn learning management system, where students read content, complete assignments, and participate in group discussions. Online distance learners have the same access and library privileges as on-campus students, including the virtual student center and a virtual learning center. The learning center supports students as they navigate through their online degrees. DePaul offers a book delivery service. Online materials are available 24/7 at this Catholic online college. The university’s online program are currently available in all states. Carlow, originally named Mount Mercy College, was founded in 1929 by the Sisters of Mercy. Carlow has been recognized for outstanding faculty and a commitment to innovative, learner-centric programs. The university offers a variety of online degrees, including an all-online RN-to-BSN undergraduate level program. Graduate programs include Master of Business Administration — which is offered completely online or in a hybrid format — Master of Science in Fraud and Forensics, and a Master of Science in Education with Certification in Special Education (Pre K–8 and 7–12). Carlow’s official campus learning management system is CelticOnline. Online students at Carlow complete weekly assignments, readings, discussions, group work, exams, and other activities through modern communication technologies like chat, video conferencing, phone calls, email, social media, bulletin boards, and online office hours. The schools boasts a Center for Digital Learning and Innovation that assists learners through the process of earning their online degrees. Saint Joseph’s, a Roman Catholic liberal arts college near Sebago Lake in Standish, Maine, is the state’s only Catholic college. The school, founded by the Portland Regional Community of the Sisters of Mercy of the Americas in 1912, offers two different options for online learning. Self-directed learning is an independent model available all year, with start dates at the beginning of each month. Classes are offered in 15-week periods and involve assignments, exams, and participation in discussion boards. Students who opt for cohort online learning complete the program in small groups of 10–15 students over 10-week periods. Coursework is delivered through the learning management system, Brightspace. Saint Joseph’s is one of the only Catholic colleges online that has a study abroad opportunity for online students. The school has an Office of Continuing Education and Training that provides further educational opportunities, including professional development non-credit courses. Saint Joseph's offers many tools and resources for online learners, such as personal advisors and an online tutoring service through Smart Thinking. Saint Louis is a Jesuit, Catholic university located in the heart of St. Louis, MO. The school has a sister campus in Madrid, Spain, and is dedicated to providing a rigorous education to transform students into bold leaders. Saint Louis offers many quality, fully online bachelor and master degree programs through SLU for Busy Adults. Online classes include bachelor’s degrees in Aviation Management, Computer Information Systems, Nursing - RN to BSN, and Security & Strategic Intelligence. Graduate options include MA in Leadership & Organizational Development and MS in Applied Analytics. The school offers five accelerated bachelor’s to master’s programs, saving students time and money. SLU utilizes Blackboard as its online course management system. Students at this Catholic college online interact with instructors and classmates through discussions in message board format and online chats. Students complete homework and audio and video assignments. SLU online classes are organized into weekly tasks and are synchronous. Benedictine is a liberal arts school rooted in the Roman Catholic tradition and Benedictine heritage. The school has several online master’s options, such as MBA, MPH and MSN, and multiple dual degree options. Undergraduate options include BA in Management and BA in Organizational Leadership. Upon acceptance into programs, students enroll in the self-paced Success Strategies Course and the New Student Orientation, both are designed to acclimate students to the online learning environment. Classes are offered in an asynchronous format. Coursework is based on the latest research from the Community of Inquiry Framework, which works to ensure the communal aspect of teaching and learning is not lost online. This online catholic college partners with the online student tutoring service, Smart Thinking, and provides a 24-hour online writing center and more. Faculty are available for online students through weekly webinars, office hours, live chat, and discussion boards. Benedictine offers 24/7 technology support for online students. Viterbo, founded by the Franciscan Sisters of Perpetual Adoration in 1890, is a liberal arts school located in La Crosse, Wisconsin. One of the best online Catholic colleges and universities in the nation, Viterbo boasts many student-focused, flexible online programs designed for busy working adults. Through the Center for Adult Learning, online students can earn their associate’s or bachelor’s degrees in accounting, nursing, healthcare management, criminal justice, and more. The school offers four hybrid programs, including Substance Abuse Counseling and Organizational Management. Online students can work towards teaching certifications in special education and endorsements in early childhood and talented and gifted education. Online students at Viterbo have access to the center for student success and an academic resource center that offers online resources and math and writing tutoring with Smart Thinking. Coursework if delivered through Moodle, Viterbo’s chosen learning management system. Newman, located in Wichita, Kansas, is a Catholic university named after John Henry Cardinal Newman. The school was founded in 1933 by the Adorers of the Blood of Christ. Newman is committed to a global perspective, justice, and peace. Newman University offers two online undergraduate programs — RN to BSN and Business Studies — and two online master's degree programs — Master of Theological Studies and Master of Arts in Theology. Those who are interested in the the Bachelor of Business Online degree may qualify for the Adult Re-Entry Program, which features reduced tuition rate options for anyone who has been out of school four years or longer. Online instruction is delivered through Blackboard and Moodle and includes interactive online modules such as video clips, PowerPoint presentations, web-based group interactions, and discussion boards. Distance learners are expected to complete reading and writing assignments and participate in discussion boards. Students are provided with online versions of the lectures, discussions and other activities. Saint Mary, a Catholic liberal arts university founded by the Sisters of Charity of Leavenworth in 1923, boasts a close-knit community with a faculty dedicated to a personalized approach to teaching. Located in Leavenworth, Kansas, this Catholic online college offers fully online degree programs, including RN to BSN, BS in Health Information Management, MS in Nursing, and a Master of Business Administration. Saint Mary offers several start dates per year to provide maximum flexibility. Online students have access to a student services coordinator, an admissions advisor, and the Personal Support Center, which is open 24/7 to answer questions. Coursework is delivered through eSpire, the school’s chosen learning management system. Online Saint Mary faculty ensure the curriculum is just as challenging as the on-campus programs. The university is accredited by the Higher Learning Commission of the North Central Association of Colleges and Schools. Siena Heights University, located in Adrian, Michigan, is a Catholic University founded and sponsored by the Adrian Dominican Sisters. Siena Heights’ College for Professional Studies Distance Learning program has been offering online courses since 2004. The college, designed for adult students, has undergraduate online education programs offered in flexible eight-week formats and ten-week blended-online graduate programs. Students can choose between business, nursing, communication, and multidisciplinary studies. The school offers minors in IT, healthcare management, and marketing. Communication is either synchronous or asynchronous, depending on the course taken. Students participate in chat sessions, discussion forums, and bulletin boards. Learners at this online Catholic college have access to numerous resources online, including academic advising, financial aid, online library database and support, student accounts, and technical support. The school tries to create a classroom environment in the online world by designing a curriculum that has students communicating on discussion boards, one-on-one for group projects, and other activities. Immigration: New York-based Catholic Charities has a long history of providing life-changing services for immigrants. This organization helps people reunite with their families when they arrive to the United States, obtain the proper documentation and work authorizations, prepare for citizenship tests and acclimate to the American way of life. Thousands of families have received assistance and support from Catholic Charities, and the organization provides printed information for immigrants in more than 200 different languages. Refugee assistance: Jesuit Refugee Service North America is one of the many Catholic organizations that strives to help victims of forced displacement and exile. JRS operates in nearly 50 countries, providing programs in education, health services, and social assistance for some of the world's most vulnerable people. Hunger relief: Founded in the late 1960s as the St. Mary's Food Bank, Feeding America is currently the country's largest organization targeting domestic hunger relief. FA boasts a nationwide network of 200 food banks that supply meals to 46 million people who are at risk for hunger, including 12 million children and seven million senior citizens. Multidisciplinary humanitarian aid: Catholic Relief Services assists impoverished and disadvantaged people living overseas through a wide range of educational programs. These include trainings in agriculture, microfinance, water and sanitation, healthcare and capacity building; CRS also provides emergency response and recovery services. The organization serves millions of people spanning more than 100 countries on five continents. Intellectually stimulating, personally rewarding careers like these are available with Catholic-based service organizations across the country. Because public service and stewardship are such vital aspects of the Catholic tradition, Jesuit colleges and universities are happy to connect students with nonprofits doing good, effective work. Ultimately, the best online Catholic colleges not only provide a high-quality education for students, but also a valuable foundation that allows them to positively impact the world.